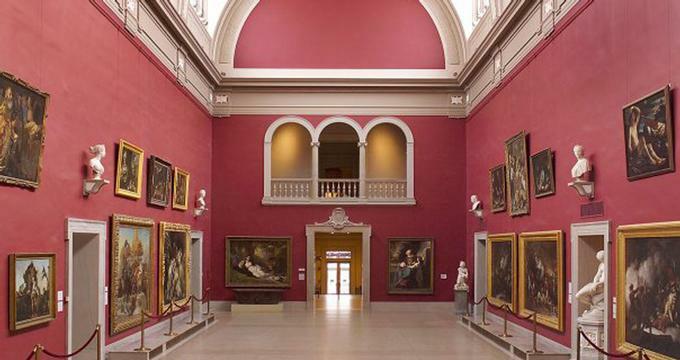 Founded in 1842 by Daniel Wadsworth, one of the first major art patrons in America, the Wadsworth Atheneum Museum of Art in Hartford opened just two years later with only seventy-nine paintings and three sculptures. Today its entire collection exceeds 50,000 pieces – the work of active acquisitions by curators, patrons, and directors, who uphold Wadsworth’s commitment to collecting and supporting the work of living artists. Interestingly, Wadsworth’s original plan was to create a fine arts gallery, but he was persuaded at the time instead to establish an atheneum, a nineteenth-century term for a particular type of cultural institution. The Atheneum is America’s oldest continuously-operating public art museum. Today, the museum’s collections cover 5,000 years. Within the collections are featured the Morgan collection of Greek and Roman antiquities and European decorative arts; world-class surrealist and baroque paintings; an inspired host of Hudson River School landscapes; American and European Impressionist paintings; masterpieces of the modernists, plus so much more. 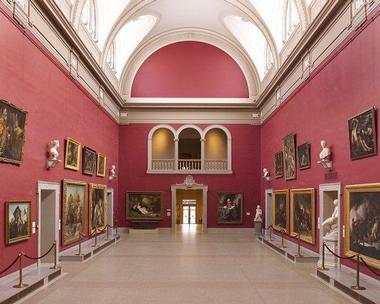 Five connected buildings comprise The Wadsworth Atheneum. The first was the Gothic Revival Wadsworth building of 1844, designed by the eminent architects Alexander Jackson Davis and Ithiel Town. This building once held the art gallery, Natural History Society, the Connecticut Historical Society, and the Young Men’s Institute, which later became the Hartford Public Library. The Watkinson Library of Reference was added to the original building in the 1860s. The Tudor Revival Colt Memorial of 1910 and the Renaissance Revival Morgan Memorial of 1910-15, designed by Benjamin Wistar Morris, provided new space for a collection that was expanding. The Avery Memorial opened in 1934 and was the first American museum building with a modern international style interior. By 1964, the institutions not affiliated with the art museum had moved to other Hartford locations. When the Goodwin building, designed in a late modernist style, opened to the public in 1969, the entire facility was devoted to the fine arts for the first time, Daniel Wadsworth’s original intention. The art gallery at the museum developed methodically through its early days, with a collection that consisted largely of history paintings, and American landscapes, and portraits, by artists such as Thomas Cole, John Trumbull, and Frederic Church, plus some Victorian sculpture. Elizabeth Hart Jarvis Colt, in 1905, bequeathed to the museum over 1,000 objects, such as Hudson River School paintings, decorative works, and the firearms collection of her late husband Samuel Colt, plus money for the construction of the Colt Memorial. J. Pierpont Morgan, the famous Hartford native, offered to build the Morgan Memorial in 1907, and 10 years later, JP Morgan Jr. gave the museum his father’s inestimable collection – which included Meissen and Sevres porcelains, ancient bronzes, Renaissance majolica, 17th century ivories and silver gilt objects. Morgan purchased the esteemed Wallace Nutting collection of American “Pilgrim Century” furniture and decorative arts. Thee bequest of Frank C. Sumner, in 1927, established the Ella Gallup Sumner and Mary Catlin Sumner Collection fund, which enriches the museum’s holdings to this day by enabling it to purchase supremely beautiful paintings. The museum was the first American museum to acquire works by Dali, Caravaggio, Mondrian, Miro, Balthus, Harnett and Cornell. 1n 1927, the so-called modern history of the museum commenced as A. Everett “Chick” Austin, Jr., was appointed director. He was at the helm for 17 years, and during that time, founded the museum’s European paintings collection, concentrating on the baroque field, and acquiring leading modernist masterpieces. Austin introduced emerging art forms – photography, music, dance, theater and film – that were new to museums at the time. His former house, the Austin House, is the largest object in the museum’s collection and a National Historic Landmark. The European Art collection contains about 900 paintings, 500 sculptures, and 3,500 works on paper, ranging from the medieval to the modern period. The Atheneum’s European collection is especially vital in Italian Baroque painting from the likes of Bernardo Strozzi, Caravaggio, and Orazio Gentileschi. Surrealist art is demonstrated by Salvador Dalí, Max Ernst, Joan Miró, and René Magritte. There are some exceptional works by Pierre-Auguste Renoir, Claude Monet, Joseph Wright and William Holman Hunt. The European Decorative Arts collection holds some 7,000 objects. More than 1,300 of these are from J. Pierpont Morgan, including ancient glass and bronzes, and Venetian and façon de venise glass. The museum has an extensive ceramic collection, namely 18th and 19th century English pottery and porcelain, 19th century Sèvres porcelain, Berlin and Meissen Art Nouveau porcelain, and pre-Columbian pottery, Chinese export and domestic porcelain. The museum’s Costume and Textiles collection has about 2,500 textile objects and 5,000 costumes and accessories – from Coptic to Contemporary, in size from thimbles to tapestries, and from each continent. One may see Native American baskets, African American story quilts, and contemporary fiber art. Some holdings are unique, like paper gowns created by contemporary artists for the museum’s Paper Balls of 1936 and 1966. The museum has a vital Lifar collection of Ballets Russes drawings and paintings as well as costumes from the Ballets Russes. Cheney Brothers textiles are also on view. In the American Art collection, there are about 1,000 paintings, 400 sculptures, and 4,000 works on paper. 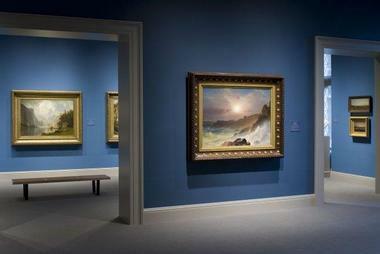 One of the highlights is the museum’s Hudson River School paintings. Collection masterpieces include 18th century portraits by John Singleton Copley and Ralph Early, still lives from the 19th by the Peale family, with important contributions by Georgia O’Keeffe, Marsden Hartley, and Andrew Wyeth. Horatio Greenough, Gaston Lachaise, Harriet Hosmer, Elie Nadelman, Paul Manship, and Alexander Calder, as well as other noted artists, constitute the museum’s American sculpture collection. This collection represents the history of material culture in America and New England. Noted pieces include chests made in the 17th century to modern works by Frank Lloyd Wright and Marcel Breuer. Elizabeth Hart Jarvis Colt donated Colt Firearms in 1905. The museum celebrates Connecticut craftsmen like Samuel Loomis, who made Colchester/Norwich style furniture, and Eliphalet Chapin, perhaps the state’s most famous cabinetmaker of colonial times. The designs of George Nakashima are also in this collection. Since its opening in 1844, the museum has hosted artists of its own time – from Frederic Church and Thomas Cole to Salvador Dalí, Andy Warhol, Piet Mondrian, and Sol LeWitt. 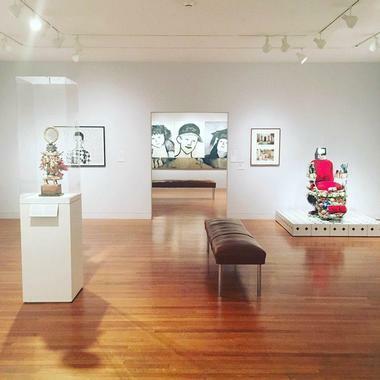 The museum’s Contemporary art collection features works created from 1945 to the present with strong examples of Color Field painting, Abstract Expressionism, Conceptual art, Pop art, and movements in sculpture, painting, photography, sculpture, and video. The museum has supplemented its acquisitions from its MATRIX program—created in 1975—to include work by many past MATRIX artists, namely Duane Hanson, Robert Mapplethorpe, Christian Jankowski, Ellsworth Kelly, Glenn Ligon, Lorna Simpson, Lee Lozano, William Wegman, and Cindy Sherman. The Amistad Center for Art & Culture was founded in 1987 and is a not-for-profit cultural arts organization that has collected 7,000 pieces that include art, artifacts, and popular culture objects that document African American heritage. While The Amistad Center is located at the Atheneum, it is an independently incorporated 501 (c) 3 organization. Its goal is to celebrate and interpret African American humanities and arts and to educate the public about their importance and influence in American life. The Museum Café is even open to non-visitors. In fact, if you want to dine in the café, but don’t have time to experience the galleries, just contact the staff at the Information Desk to receive complimentary admission to the café. It’s ideal for those who want a new lunch hangout downtown or crave a change from bringing lunch from home. The Museum Café is open for lunch Wednesday through Sunday. Visitors will find soups, savory sandwiches, freshly prepared appetizers, healthy salads, and mouth-watering flat breads. After your day at the museum, why not stop into the award-winning Museum Shop? Here, visitors will find handmade works by local artisans, books, items for the home and office, children’s gifts, handcrafted jewelry, paper products, plus other merchandise. Read more: 25 Best Things to Do in Hartford, Connecticut.